The Queen Elizabeth II Centre is the latest venue to benefit from gaining more leads and higher value sales conversions after upgrading the buyers’ experience with a vFloorplan, which has taken centre-stage on multiple sections of its new website. The QEII Centre is situated in the heart of Westminster – close to the Houses of Parliament, Supreme Court and Westminster Abbey – and is London’s largest dedicated conference and event space, hosting over 400 events each year. The award-winning venue offers 32 event spaces over seven floors, making it one of the most versatile meeting, conference and banqueting options in the capital. The venue has invested in a vFloorplan v3 with enhancements including a fully interactive, mobile responsive HTML5 floorplan with a Lift-the-Lid 3D CGI representation of the venue, surrounding features – including the green used for photographs in front of the property – and all of its flexible spaces. Allowing website visitors to virtually explore each floor and see the spaces at QEII Centre not only removes any uncertainty in buyers’ minds, it helps the venue maximise sales opportunities and offers other room ideas for breakouts and receptions which the prospect may not have otherwise considered. 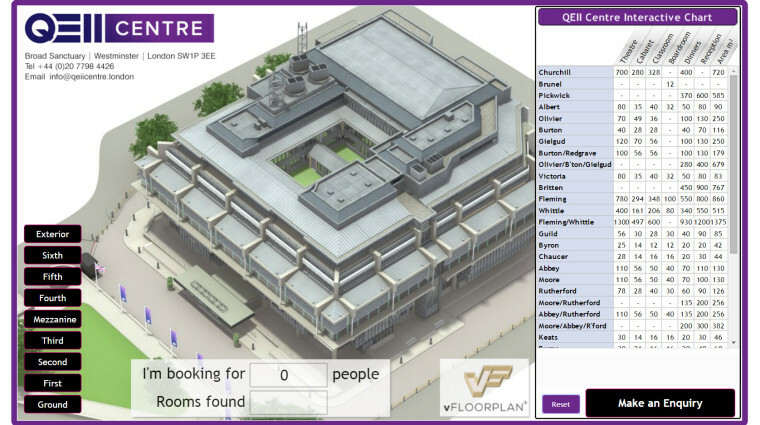 Once someone looking for event space in Central London has explored the QEII Centre vFloorpan online – which includes being able to search all the rooms for the best fit to their numbers – their enquiry details and choice is sent to the venue sales team at QEII Centre who can arrange the next steps. vFloorplan overcomes any large venue’s biggest issue – buyers not fully understanding the layout – which requires sales people to try to explain the options. The buyers may also be unaware of other rooms that could benefit and enhance their event experience. With so many combinations of rooms and layouts available, including partitioned spaces and position to lifts and other facilities, understanding the location, layout and proximity of the rooms and spaces to one another can be a daunting prospect. Even when buyers are looking around in person, the sheer scale of the venue makes it baffling to visualise every option, especially when the rooms are laid out in a different room style to the one being considered. Now with vFloorplan, every combination and layout is available to consider online, a search can be made and further filtering of rooms according to room layout style for each buyer’s particular needs can be performed before making a selection and enquiry. The venue sales team can also use vFloorplan to highlight how rooms and facilities relate to each other in the QEII Centre to make variations work for the buyer and upsell space, delivering greater profit. Additionally, for staff and suppliers, the QEII vFloorplan provides an excellent training aid. Furthermore, vFloorplan gives the QEII Centre a distinct competitive advantage over other venues in the highly competitive market in central London by vastly improving buyer experience and increasing lead generation. 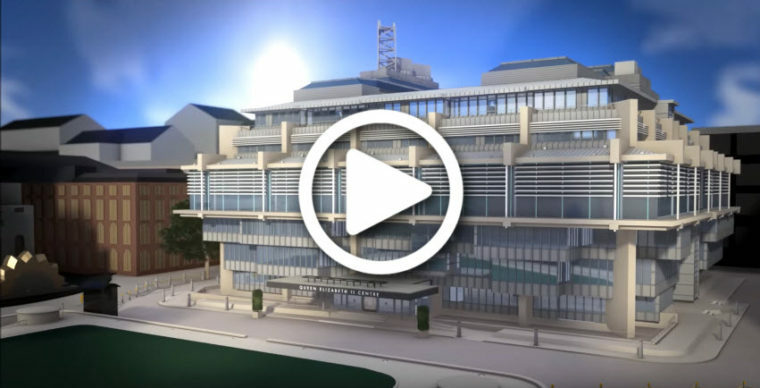 QEII Centre is a huge building, the location of which many people cannot quite place, so we were also asked to create a new flythrough video to show where the QEII Centre is in relation to the Thames and Parliament Square. We created a life-size, bespoke 3D fly-through video as an epic animation that shows off the venue so well that QEII has placed it on the home page of the new QEII Centre venue website. Check it out below – we are sure you can guess the theme? Discover how vFloorplan transforms your buyer’s experience using an interactive vFloorplan, interactive 360s and eye-popping CGI videos, to deliver more qualified enquiries, speed up the sales process and generate you a high return on your investment. Please call us today on +44 (0)1908 889294. This entry was posted in Featured Blogs, Featured Projects. Bookmark the permalink.